Fed up with waiting for the infinitely-delayed Plastic Logic Que I took the plunge and bought a Kindle 2. 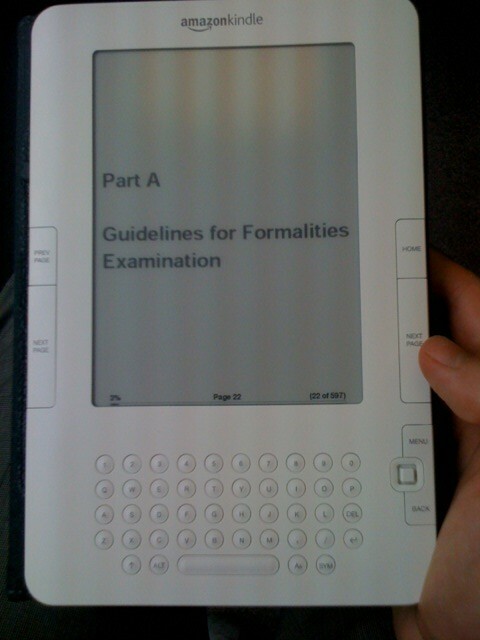 The Kindle is excellent for reading novels on the go but is it any use in the practice of patent law? The 2.5 Kindle software update (which appears to be the basis of the software for Kindle 3) has a basic, yet functioning, PDF Viewer. This helps. 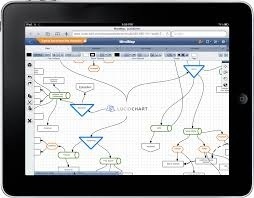 Most official patent documentation comes in PDF format. You can also convert PDF files to the native Kindle file format using either Amazon’s free conversion service (email [your log-in name]@free.kindle.com with file attached) or using a free publishing application. Certain documents are (just about) readable on the 6″ screen without zoom. These include the UK Formalities Manual, the UK Patents Act & Rules, and the EPO Guidelines. The text is roughly US-specification size. 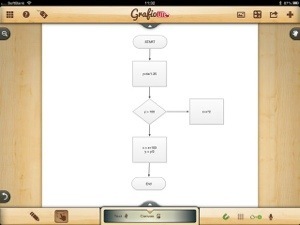 You also have the option to rotate the screen to a landscape configuration. 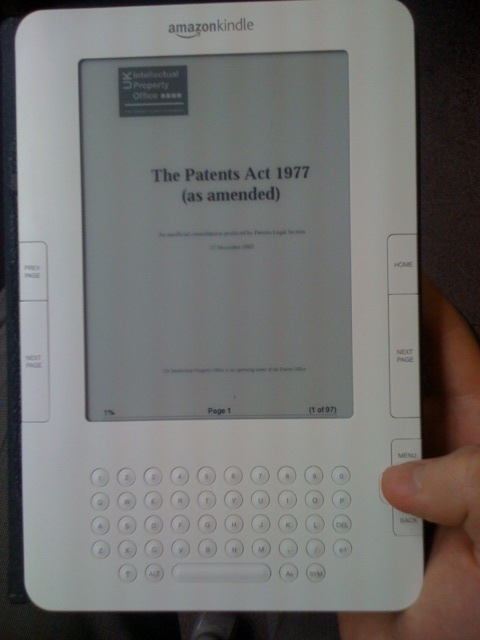 This allows the UK Manual of Patent Practice to become readable (although a page is split into 3 or more parts). However, other documents like the EPO’s National Law Compendium are unreadable due to the small font size in full-screen mode and inadequate zoom (a page splits into many parts arranged both vertically and horizontally). 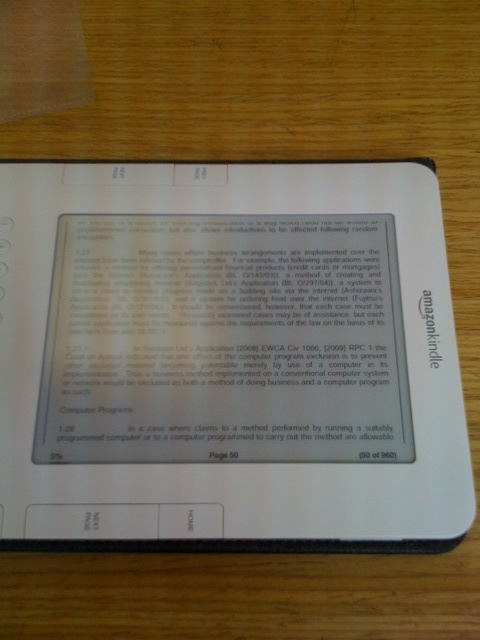 The main advantage of the Kindle is its eInk screen. I have always found that LCD screens and monitors quickly burn out my eyes. 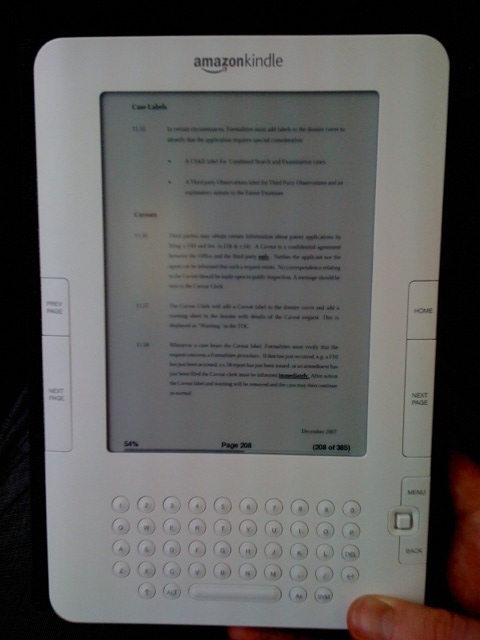 The eInk screen is much easier to read without tiring. Try staring at a monitor for twenty minutes then staring at an etch-a-sketch for twenty minutes; that will give a good impression of the advantages of eInk. For business documents the ideal screen-size is A4. 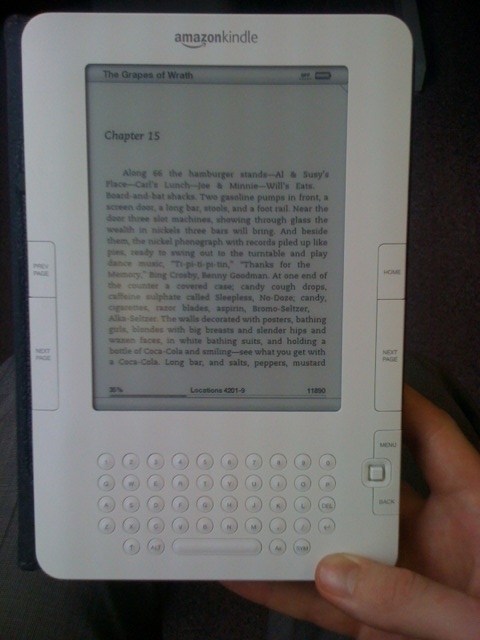 However, the number of A4-sized eInk readers is limited. The best of the bunch is probably the Kindle DX, however, its weight and size make it unwieldy and at $379 it costs $200 more than the Kindle 3 (wi-fi only priced at an amazingly low £109 in the UK). It is interesting to note that many promising A4 eReaders from CES in January have now fallen by the wayside, including the Que and the Skiff. This makes the Kindle 3 a good stand-in while the A4 (and hopefully touch-screen) technologies come to market (I expect Christmas 2010 if the Kindle 3 is a success). I will keep you updated as to my eReader adventures.